Manchester City, fresh from the big cup upset at Wigan earlier in the week, face Arsenal in the Carabao Cup final on Sunday. 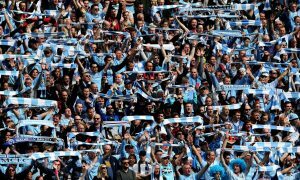 With the prospect of a quadruple now out of City’s reach, a victory against the Gunners can secure Pep’s first trophy in England and ensure all remaining efforts this season are focused on the two big competitions, the Premier League and the Champions League. Arsenal come into this fixture having won only four times in all competitions this calendar year. Their form has fluctuated, having fallen well behind in the league, losing to Ostersunds FK at home on Thursday but somehow finding themselves in yet another cup final. Arsenal have become somewhat Wembley specialists in recent years, winning their last eight appearances there in domestic cup competitions. It might be Tottenham’s interim stadium but Wembley really is Arsenal’s turf these days. The Arsenal set-up will look a lot different to the team that beat City in the semi-final of the FA Cup last season with players like Alexis Sanchez, Giroud, Oxlade-Chamberlain, Coquelin and Gabriel who made appearances that game having all departed since. In their stead, Arsenal have brought in Mkhitaryan, Lacazette, £56m man Aubameyang and seen Wilshere return to the first team. Mkhitaryan however is cup-tied. But results haven’t seen an upturn and it looks set to be another season of discontent and disappointment for the North London club. Yet somehow, Wenger manages to cling on onto power, crucially because he wins these sort of games, trophies that the board uses to justify granting him a new lease of life. There’s only one man to watch out when Arsenal play at Wembley and that is Aaron Ramsey. He wasn’t expected to make this fixture but he has already trained twice and will have a late fitness test. His record in this stadium is remarkable. Of the 34 players used in Arsenal’s eight match unbeaten run at Wembley, Aaron Ramsey has played 98% of those minutes (830/840mins), much more than the 530 mins played by Mesut Ozil and Santi Cazorla, the second most frequent players. In those minutes he’s produced two late FA Cup final winners – signature lung-bursting runs from midfield – an assist and several Man of the Match performances. Ramsey rises to the occasion every time and is usually the difference when it matters most. Keeping him quiet will be key to stifling Arsenal’s play. To get some insight from The Arsenal ahead of the Cup Final, I spoke to notorious #LatteFirm Tweeter FK. Faisal: The Arsenal. Nice touch. I’m Faisal, or better known as ‘FK’. You can find me and block me; @fkhanage. First of all, can you tell us what you’ve made of Arsenal’s season so far? How have you fared in each competition? *Sigh*. It’s been so bad. I know this may seem exaggerated given this is a League Cup final preview, but it really has been terrible. We struggled last season but managed to salvage a poor league campaign with a record 13th FA Cup and this was reason to be optimistic going into 2017/18, but it’s been worse. It’s only February and Arsenal have already lost 11 games (across all competitions), yet here we are, going back to Wembley for a fourth final in five years. Our Premier League campaign has been abysmal. Lying 6th in the table, 27 points behind the league leaders, 8 points away from the Champions League places and lagging 7 points behind our local rivals, the club has seen better days. We’ve conceded 36 times in the league, only one less than Swansea who are flirting with relegation. Being dumped out of the FA Cup at Nottingham Forest was the lowest point for me. A competition that I love, and grew up watching, to go out with such a limp, lacklustre performance was embarrassing and inexcusable by Wenger. So it comes to down to the League Cup, a tournament we have belittled in the past (and rightly so) but a piece of silverware nonetheless. It’s nowhere near the top of the list of things we want to win and achieve as a club, but it would be nice to win. I’m writing this on the morning after our lame home 2-1 defeat to Ostersunds FK in the second leg of the Europa League. Painfully boring to watch but most importantly we are through to the next round. There seem to be some very good teams in the last 16, so it’ll be tough to win. I of course must ask about Arsene Wenger. There’s a belief that some of his powers are being culled with the arrival of directors, major scouts and possibly even signings that aren’t his. Is that true? Could this model work? Or does Wenger have to leave if Arsenal are to have a new lease of life? I love Arsene Wenger. Thought I’d get that in early. I hate that it’s not going well for him. The man is a legend, and the greatest Arsenal manager of all time. It saddens me that the legacy he once thought he would leave, is diminishing year-on-year. I hope that, somehow, he manages to walk away on a high – he deserves that. But as things stand, I can’t see it ending positively. The club has made various changes behind the scenes; scouts, fitness, operations etc. and there are various conspiracy theories going around about what these mean and if they’re Wenger decisions or not, but honestly, I don’t know. Wenger will go one day, and if it is sooner rather than later, it’s good to see the club making such appointments to ensure as smooth a transition as possible. I think it’s really important that Arsenal takes its time appointing a successor. I’m not overly impressed with the names being banded about, so as long as we winning trophies, I’m content with Wenger. Hector Bellerin recently appeared at the Oxford Union and spoke about ArsenalFanTV. From an Arsenal fan’s perspective, do you think that platform makes everything a little more toxic and do you have a problem regarding the fact people profit from Arsenal’s failures? I think Arsenal Fan TV is a brilliant concept. Having known Robbie for many years, pre-AFTV, I know his intentions were pure i.e. to give the fans a platform to express their views, young or old, match-going or non-match-going, UK-based or international etc. The reality with these things is that sensationalism always ‘sells’ and grabs all the headlines. AFTV’s mantra is that they are open to all, me, you, anyone. Those who don’t like the headline-grabbers, will find some excellent content beneath the surface. I have no issue with Arsenal Fan TV making money. It’s an expensive operation to run, Robbie and his team work around the clock almost 7 days a week to produce content and it’s admirable really. People don’t see the effort behind the scenes. They celebrate their 5th birthday this week and they’re only getting bigger and bigger. Incidentally, fans are entitled to express their opinions but I would add that if you’re happy to dish out criticism and in some cases, abuse, you need to be willing to take it back when the shoe is on the other foot. Hector is criticised weekly and so people need to accept that he is allowed to talk back. What have you made of Manchester City this season and the work Pep Guardiola has done here? First and foremost, Guardiola is an exceptional coach, possibly the best in the game. Even though he has been blessed with the best teams/squads/budgets, you can see the impact he has on teams from individual player development like Raheem Sterling to his own brand of football. It’s true that he has the luxury of spending £200m+ on defenders alone but it’s about implementing his system and philosophy. One City player you’d take at Arsenal? It would be easy, and lazy, to suggest Kevin De Bruyne or Sergio Aguero, but I think Arsenal have lacked a positionally-disciplined defensive midfielder for years and so I would say Fernandinho to sit behind Ramsey/Wilshere/Ozil etc. Or a GK, any GK! Thinking with my heart, I think we’ll edge it 2-1. My head, sadly, disagrees and haunts me with images of a 3/4-1 defeat. #Tears.